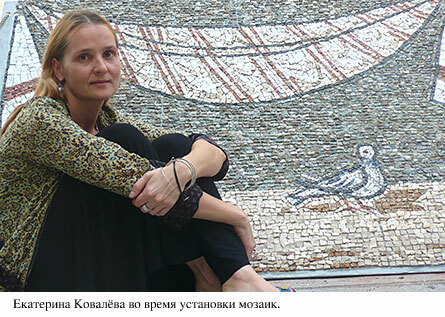 The Moscow artist Ekaterina Kovaleva created, brought from Russia and gave to the Church of Christ the Savior seven mosaic panels, which have been installed on the outside wall of the church to the great joy of parishioners and many random by-passers. Vladislav Guzner spoke with the artist about her project. V.G. 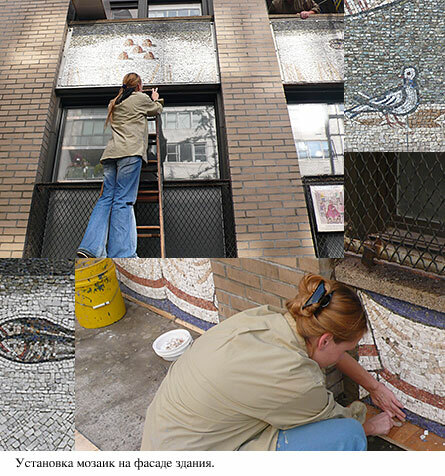 : Katya, the project is now completed, your wonderful mosaics have greatly embellished the facade of our church. This is a long-awaited and joyful event not only for the parishioners, but also, probably, for everyone who visits this street. Before you return to Moscow we would like you to tell us a little about your work on the mosaics: how did this project come about, who came up with the idea? E.K. : I first came to New York in 1991 and spent some time studying in St. Vladimir's seminary. When I came to this parish and met Fr. Michael I immediately felt an affinity with this parish. Since then I have been visiting New York, where my parents live now, almost every year. I've always come to services in this church because I felt as if I were home. I have developed a desire to do something for this parish, to work for the glory of God, and I suggested this to Fr. Michael. He liked the idea of creating mosaics for the facade of the building so that it would stand out among other houses as God's temple. By that time I've already had experience with a similar project in Groeningen, Holland. The city also has an Orthodox parish housed in a regular three-story dwelling, and the parishioners also wanted the mosaic to make their church stand out among other buildings. This is how the project began. But it turned out that the preparation and planning took up a great deal of time since I gave birth to several children one after another and I could not allocate enough time for this work for many years. V.G. : Katya, how did the concept of mosaics develop? Were you asked to do anything specific, were you given a subject? E.K. : No, no. I was given complete freedom from the very beginning. Fr. Michael have no instructions, no hints, and I simply appreciated the beauty of such trust. I have long wanted to make a mosaic of “five breads and two fishes”, these are very important images for me, symbolic of a gift, for me they are associated with personal experiences and events. V.G. : Could you tell me what defined the style of those mosaics? I remember your earlier works, they were more decorative, more Byzantine in style. Did the architecture of the building influence your work? E.K. : Yes, this was a very important aspect because a mosaic is an architectural technique, it is really a part of architecture. It is deeply involved with the tectonics of a building, in our case, of a typical, unpretentious New York building. The color of the building, its minimalistic texture largely defined my artistic task. I thought it would be strange if some kind of plant ornaments would suddenly appear here. V.G. I agree. I remember when you you sent us photos of unfinished mosaics we were surprised that, even though you were living and working in Moscow at that time, your work so naturally fit in with the style of this building and this street as a whole. But what really is interesting is that even given the purposeful minimalism of your work, the mosaics do not appear to be stylized or “modernist”, on the contrary, they look very traditional. What models were you influenced by, what are your style and technique based on? E.K. : I am interested in early Christian art, I love the 6th century mosaics of Ravenna very much. I wanted to emphasize with my style and technique that this church has roots in millennium-old traditions. But these mosaics are not copies or replicas, even though they are based on models I love: I am a contemporary artist and what takes place in the art world today is important to me. My work on the image of the Savior “Not Made by Hand” was particularly important to me. I wanted, by looking back at the works of early Christian art, to create a more universal image, not defined by the limits of the Greek, Russian or some other style. I wanted the image to be simple and accessible, “native” to the people from all Christian denominations. V.G. : It is remarkable that you have thought about this. Last year we had to temporarily remove the old icon of the Savior from the facade of our church during renovations. Suddenly, complete strangers started calling us with complaints, asking to put it back on the wall. Neighbors from the building across the street, by-walkers who were not Orthodox at all, may be even unbelievers, somehow needed this image. E.K. : I felt this last week when we were installing the lower panels: strangers on the street greeted us with enthusiasm and gratefulness. V.G. : Katya, you are going back to Moscow in a few days. What are the feelings you are leaving the city with? E.K. (laughing): I have the feeling of a job done. Seriously, this work is very important for me, because, as I have already told Fr. Michael, I do not know who gets more out of this: you or me, because this is a new stage in my life, a new self-perception in my creative pursuits. I want to continue my work in this direction, as well as in others. So I am going back happy. V.G. What is next, what new projects await you at home?